We pride ourselves in taking great care of our owners. When you sign with Cabins for YOU, you become our partner. We’ll work with you each step of the way, focusing on YOU and your property. But you don’t have to just take our word for it. 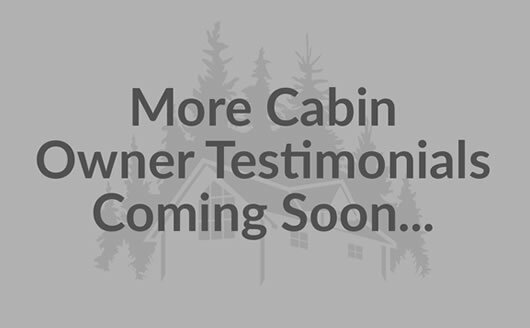 See what our owners have experienced with Cabins for YOU - in their own words! Owner Dan Higdon sets high goals for his properties, and Cabins for YOU has been there to meet them. When he teamed up with Cabins for YOU, he found personal and caring service, a responsive owner representative, and results that have made him happy. After being disappointed in 3 different management companies, Susan and Claude Childs were looking for an honest, no-surprises partnership. They found it in Cabins for YOU. With expectations exceeded each year and rental on one cabin tripled, they're now working towards a fourth investment property! Luke is a hands-on owner, and he wants the details - big or small - to be taken care of. He found an ease with Cabins for YOU, saw a great return on his investments, and found an honesty and personal attention to his cabin that he hadn't experienced before.